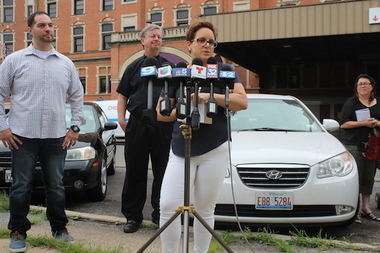 Katheryn Grosso airs concerns on behalf of St. Anthony Hospital at a Monday press conference to criticize Riot Fest. Hospital employee Edgardo Reyes (far left) and the Rev. Larry Dowling (center) also gave brief remarks. DOUGLAS PARK — West Side community members joined representatives of Saint Anthony Hospital in North Lawndale to speak out against next weekend's planned Riot Fest music festival in the neighborhood. It's the latest in a sudden dispute between the hospital, at 2875 W. 19th St., and the annual music festival, which is set to begin Friday across the street in Douglas Park. Administrators of the 131-bed hospital filed filed a lawsuit Friday seeking to halt the festival, claiming it will disrupt hospital business as well as harm patients. And with the festival's first act set to take the stage in just four days, hospital spokeswoman Katherin Grosso isn't holding out for the punk rock and hip-hop carnival to be canceled altogether. But she said patients and doctors hope the organizers will take more steps to curb noise and crowding from the fest. "We want them to make the considerations that we've asked for all along, and that means assurances that patients will have unfettered access to the front entrance," Grosso said. With more than 45,000 people projected to visit the event, Grosso added, doctors are especially worried about whether ambulances will be able to access the hospital's emergency bay during the weekend. "So far we've gotten no assurances," Grosso said. "All we've gotten is lip service." Four community members also spoke out against event organizers, including the Rev. Larry Dowling of Saint Agatha Catholic Church, 3151 Douglas Blvd., who said the festival was organized "with little regard for community concerns." Riot Fest organizers, for their part, insisted that the hospital had been on board with the festival setup before the hospital's lawyers made a last-minute about-face and sued just one week before the event. "Since June, Riot Fest has had numerous meetings with St. Anthony’s leaders including the CEO and other top-level officials," Riot Fest officials wrote in a Monday press release. "Riot Fest did 100 percent of what St. Anthony’s asked for." Moreover, organizers said, festival plans have long been approved by the city's Office of Emergency Management, fire department and police department. "We're talking about hundred-page documents that were submitted, and all these city agencies were satisfied," Riot Fest spokeswoman Chris Mather told DNAinfo Monday. Hospital officials "said there are not noise barriers, when in fact the sound is directional pointed away from the hospital and is within limits set by the city." "Also they're claiming there are going to be 45,000 people walking in front of the hospital, and that's just not true," Mather added, noting that the festival entrance will be on Ogden Avenue, on the opposite side of the park as the hospital. Riot Fest representatives on Monday released two private emails sent by St. Anthony's lawyers on Wednesday saying that unless organizers agreed to pay about $153,000, including more than $54,000 in legal fees, the hospital would move ahead with its lawsuit. “If these were critical concerns, why did St. Anthony’s not mention them in the multiple meetings we have had since June but instead waited until less than 10 days before the event to make the demand for $154,000,” Riot Fest co-founder Mike Petryshyn said, according to the release. This is the first year Riot Fest will be held in Douglas Park. It had been held in Humboldt Park for three years until neighbors there rallied against it earlier this summer. A court hearing on the lawsuit is expected Tuesday.